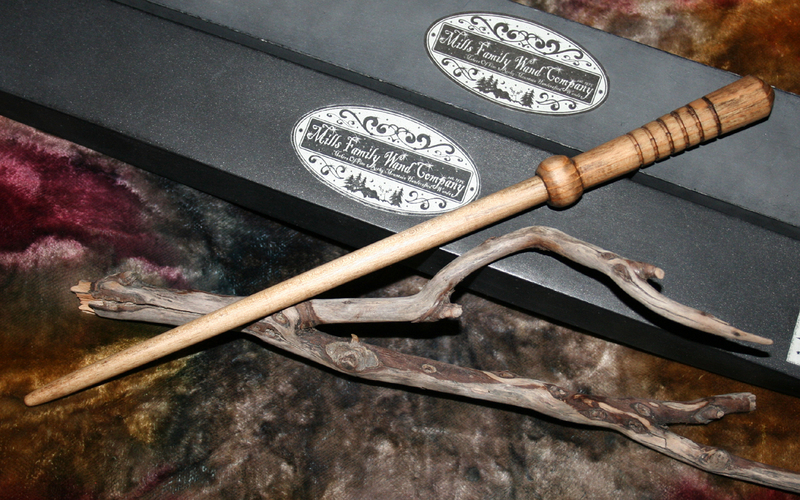 Many customers send me messages asking for wands that appear like those they were assigned on the Pottermore website. 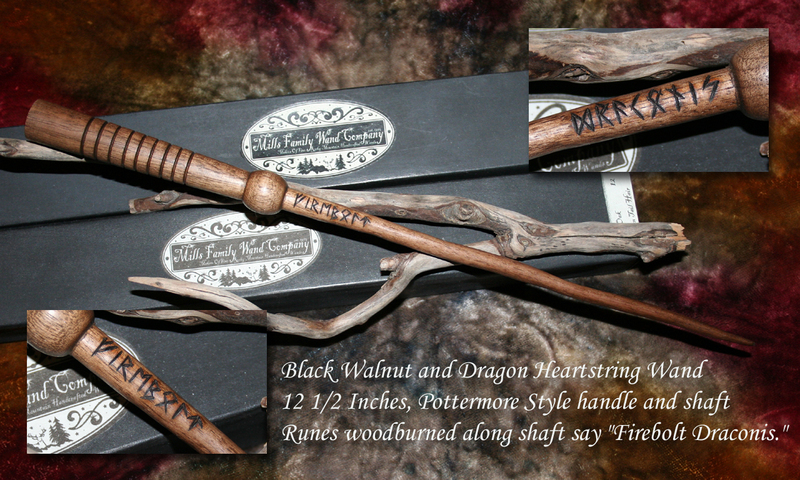 We have made ourselves available to create wands in the style of these Pottermore wands. Please be aware that we are in no way affiliated with Pottermore, Sony, or J.K. Rowling, we would like to be one of the options for purchasing wands like those found at Pottermore. When looking to purchase a wand like yours from Pottermore, please be aware of a few things. First, the wand you are given at Pottermore is created out of three standard designs. One is what we call the "banded" style. This style of wand has two knots separating the handle from the tip, as well as a series of carved twists into the handle. Another style of wand is what we call the "wrapped" style. This has a more rustic style handle with a wrapping of string or leather around the end of the handle, and a thin band separating the handle from the tip. The last type of wand style is what we call the "beaded" style. This style has a more traditional handle with a carved bead shape separating the handle from the tip and simple radial carvings about the handle. Refer to the image below for examples of such wands. The second thing to be aware of is the type of wood and how it's presented in Pottermore. What I've noticed over time creating Pottermore-styled wands is that the more I try to get the tips to look twisted and bent like those shown above, the more brittle and fragile they get. Woods like willow and pine can be treated and given a twisted appearance, but woods like walnut and oak cannot. Each wand tip can be carved to look like a twisted and bent tip, but again, they become very fragile, especially for a wand that will be more than just a display. Our recommendation is that each person wanting to purchase a Pottermore style wand should ask for the handle style they most want, but be willing to sacrifice the twisted tip for a straight one if they plan on using it or handling it regularly. The third thing to consider is that the cost of the wand is dependent on the amount of customization, the difficulty in creating it, and the cost to procure some woods. Whereas a willow wand that is twelve inches, wrapped, and straight may cost $35 USD to create, a wand that is made of ebony, fourteen inches, banded, with a twisted tip may cost substantially more. An example of a beaded handle and twisted tip. Lastly, the wands shown in the images at Pottermore are all exactly the same images, with the three styles shown above and with different colors. Wands made of plastic or resin may be made to look like any style or shape, but wands made of real wood like ours are will not be able to be shaped in the form that some wands are. If you weigh these items carefully when choosing your wand, you can be assured that you will receive a wand that you are happy with and that resembles your Pottermore wand. An example of a beaded handle and a straight tip. Any custom wand ordered through the Mills Family Wand Company needs to be payed for in advance, before the wand creating is begun. If you are interested in purchasing a Pottermore or custom wand from us, please contact us and give us the specifics you would like to have in your wand. We will then reply to you with an estimation of the cost and to work out the details. Once everything is agreed on, payment can be sent to us. Once it's received, we'll begin working on your wand. We'll send you progress pictures during the creation of your wand and keep you updated during it's creation. Once it's finished, a final image will be sent so you can give us your thumbs-up. Once everything is to your liking, we'll ship the wand to you and send a message with the shipping information so you and I can follow it on it's way to you. Let us know if you have any questions or concerns and we'd be happy to communicate with you ahead of time while you are still deciding on what you'd like!